Samford University’s School of the Arts has hosted a variety of highly esteemed artists this year including Vadym Kholodenko, Jamie Barton and the Chamber Music Society of Lincoln Center with support from Samford Arts patrons Davis Architects and the Birmingham Chamber Music Society. The 2017-18 series concludes with Sō Percussion on Tuesday, March 20 at 7:30 p.m. in Brock Recital Hall. Tickets are $30 per person or $10 for students and can be ordered online. It is percussion-based music organization that creates and presents new collaborative works to adventurous and curious audiences and educational initiatives to engaged students, while providing meaningful service to its communities, in order to exemplify the power of music to unite people and forge deep social bonds. 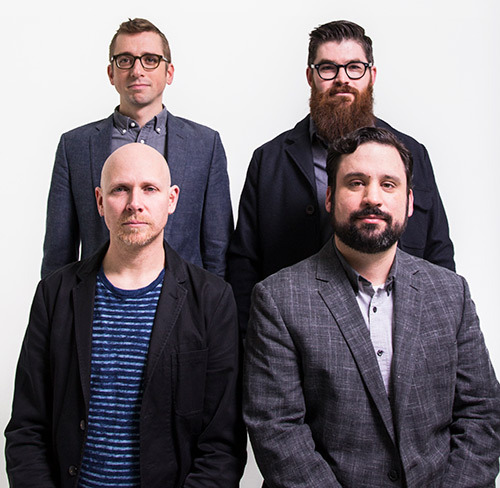 Comprised of Eric Cha-Beach, Josh Quillen, Ada Sliwinski, and Jason Treuting, Sō Percussion is the Edward T. Cone Ensemble-in-Residence at Princeton University, where they offer educational work and present an annual series of concerts. With innovative multi-genre original productions, sensational interpretations of modern classics, and an “exhilarating blend of precision and anarchy, rigor and bedlam,” (The New Yorker), Sō Percussion has redefined the scope and vital role of the modern percussion ensemble. Sō’s repertoire ranges from “classics” of the 20th century, by John Cage, Steve Reich and Iannis Xenakis, to commissioning and advocating works by contemporary composers such as Caroline Shaw, David Lang, Steve Mackey and Paul Lansky, to distinctively modern collaborations with artists who work outside the classical concert hall. Sō Percussion also composes and performs their own works, ranging from standard concert pieces to immersive multi-genre program, including Imaginary City, Where (we) Live, and A Gun Show, which was presented in a multi-performance presentation as part of BAM’s 2016 Next Wave Festival. In these concert-length programs, Sō Percussion employs a distinctively 21st century synthesis of original music, artistic collaboration, theatrical production values and visual art, into a powerful exploration of their own unique and personal creative experiences. Recent highlights include appearances at Lincoln Center Festival, Bonnaroo, the Eaux Claires Festival, MassMoCA, and TED 2016; international tours to Poland and Ireland; performances of man made with Gustavo Dudamel and the LA Phil; Bryce Dessner’s Music for Wood and Strings at the Barbican in London; and an original score for a live performance and broadcast of WNYC’s Radiolab with Jad Abumrad and Robert Krulwich at BAM.